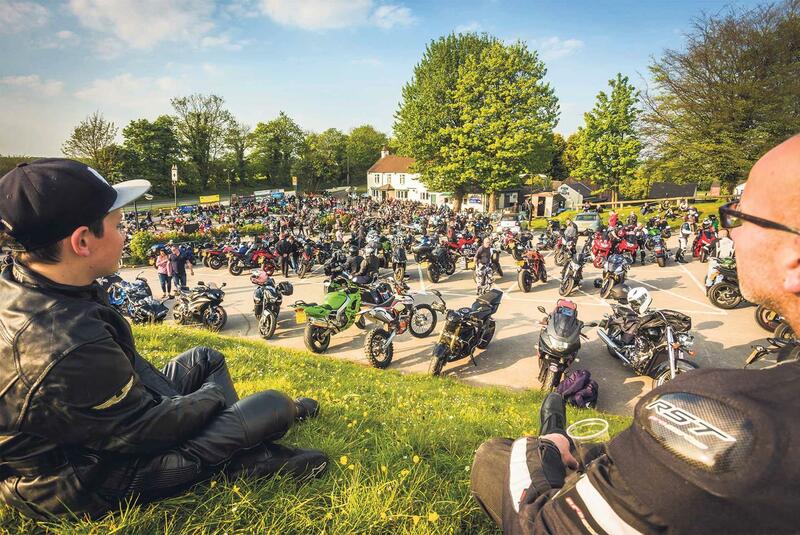 There’s nothing quite like punctuating your rideout with a stop-off at a top biker haunt and this Sherburn spot is a stunner. I want a giant mug of tea, so heavy I can barely hold it with one hand. I want a huge carpark full of diverse machines. I want greetings, smiles, and a friendly ‘ey-up’ from the locals. And I want my food served in huge proportions, preferably by a Yorkshire lass in a tabard. In other words, you can keep the Ace Café and the über cool Bike Shed, I’ll take the traditional Squires Café in Sherburn-in-Elmet, Yorkshire every time. When I was a spotty teenager, every Wednesday night was Squires night; an extremely sporty 30-mile ride from home to Sherburnwith my tightknit group of likeminded buddies. This mid-week trip was mandatory, and luckily my Kawasaki KR-1 never let me down, despite my best attempts to wheelie it to a standstill. These were the mid 1990s when we were a country drenched in sportsbikes and all the action at Sherburn occurred at old café, which was a few miles down the road from the current location. The air was rich with the smell of two-strokes and fish and chips soaked in vinegar. Occasionally a renegade local would pop a wheelie and hold it all the way up the hill or the excited hum of conversation would be interrupted by the sound (and rubbery smell) of someone burning out a rear tyre. Harry, the café owner, would be working like crazy to keep up with the demand for coffee and tea, while some nights well-known faces like local TT hero David Jefferies would drop in for a chat. My buddies and I would walk the tightly-packed bike parks, checking out the latest machines, kit and bolt-ons. Sherburn is where we gazed upon new models for the first time, saw our first Ducati 916 and Honda RC45 and witnessed the emergence of the streetfighter specials (mainly modded GSX-Rs) that were parked proudly outside the main door. And anyone whose leathers had scuffed knee sliders was given instant kudos. Squires wasn’t universally popular, especially with some of the locals who understandably didn’t see eye-to-eye with stunt-pulling hooligans like me, and in 2002 the café moved to its current venue. I still pop down on the odd Wednesday night to meet up with the hooligans, who of course have grown up. While the ride to the café is more sedate, that magical atmosphere remains. It’s still easy to lose track of time strolling among the bikes, spotting models you once owned or wished you’d owned. Still the occasional homemade streetfighter will turn up or, more likely these days, a shed-built café racer. Local racers like British Superbike star Dan Linfoot are to be found doing the rounds and if you’re eager to see a hot new model, Squires remains the place to look. And don’t worry about visiting on your own; within minutes of arriving someone will engage you in friendly conversation. In the height of summer it's not uncommon to have over a 1000 bikes roll in with even more enjoying the roads that help make the Sherburn area so special. For me, venues like The Ace Café and Bike Shed in London are great places to hang out, but the fact they’re surrounded by congestion and speed cameras reduces their appeal. I’ll take Sherburn every time, but then again I might be a slightly biased Yorkshireman. Dan Linfoot, Honda BSB star:"I pop down to meet up with my dad and friends, or just for something to eat; I took my daughter there just last week. Usually I'll either ride down on my Honda Grom or even cycle, as it’s not too far from the house. I love the atmosphere, there is always plenty of bikes. It’s a great spot." Adam Thompson, regular: "There are loads of good roads and different routes into Sherburn; you can't go wrong. It's always packed, especially on a Wednesday night. I ride over, have a brew, and always end up chatting to another Sherb’ regular. Then I ride home a different route. It's mint." Squires Milk Bar was opened in 1954 at the original location in Sherburn-in-Elmet. 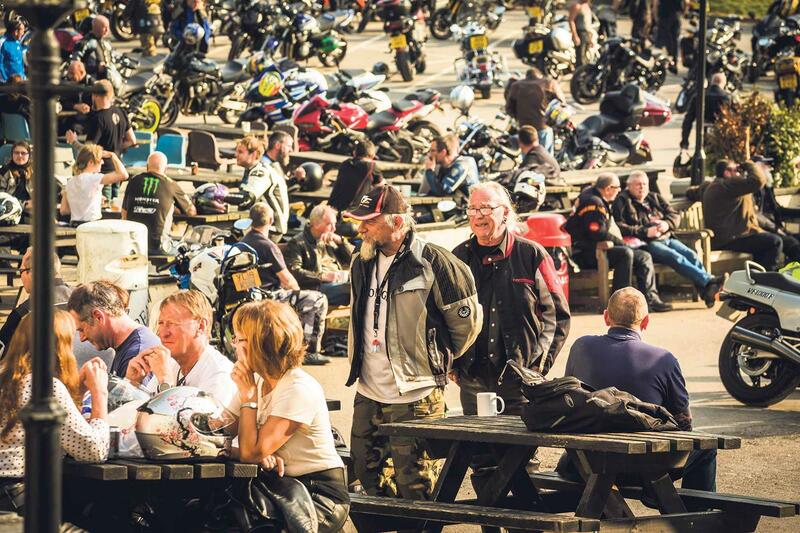 It soon became popular as bikers flocked to the café to listen to tunes from the juke box on a Wednesday night. Harry Weston, a Wednesday night regular, purchased the café in 1974 with his wife Sue. As popularity increased, and to reduce congestion in the small village, the café moved to its current, larger location in Newthorpe, just a few miles away. Harry and Sue retired in 2007, but are still seen at the café which carries the values and culture of the original.